Links to this page can be found in Book 1, Map A3, Day 2 and Rione Monti. 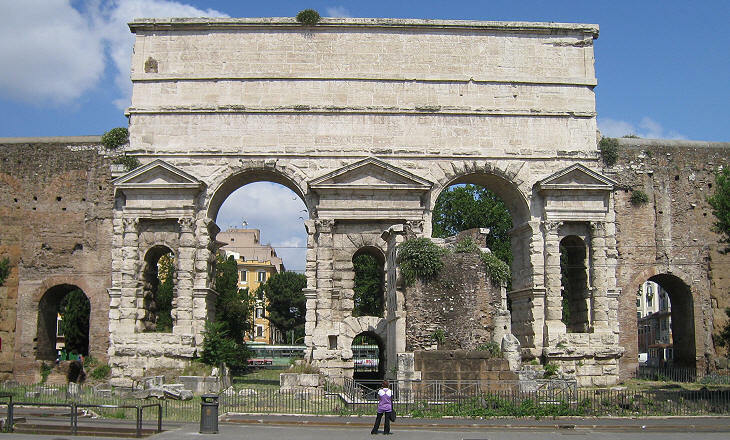 In 52 AD Emperor Claudius built a double monumental arch across Via Prenestina and Via Labicana (today Via Casilina) to celebrate the completion of two aqueducts. 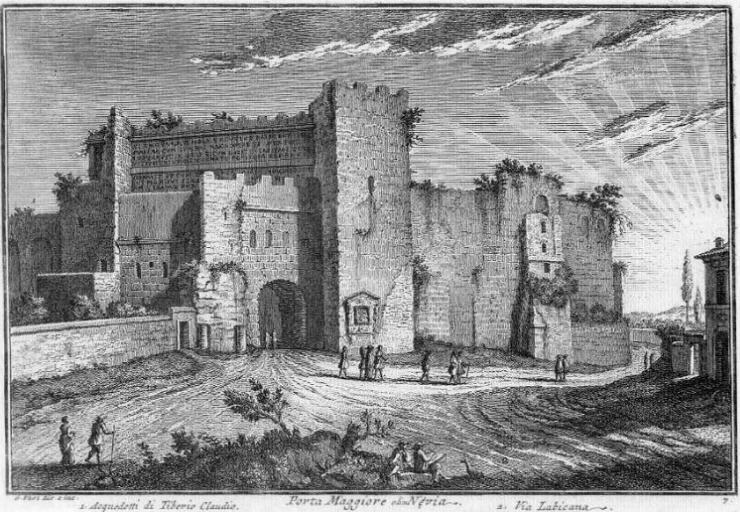 The plate shows the fortifications which turned the arch into a well protected gate. 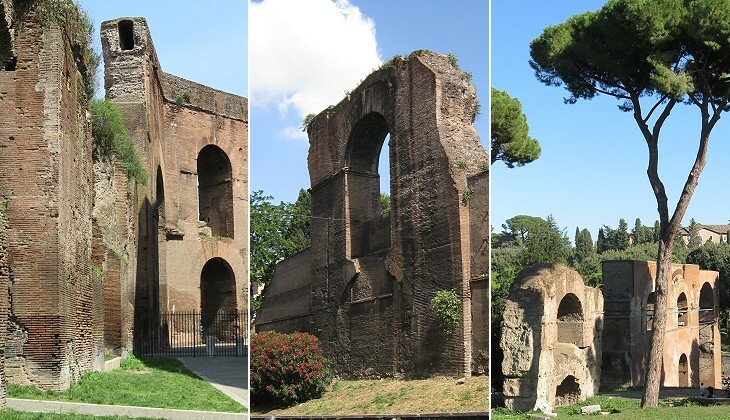 The walls built by Emperor Aurelian in 275 reduced the size of the openings of the arch; Emperor Honorius built a new gate in front of the old one in the early Vth century; it was flanked by a high tower and by a smaller one which incorporated a funerary monument. Maggiore in Italian means greater, but the name given to the gate is not related to its size; it is thought to be a contraction of Porta di S. Maria Maggiore because it allowed direct access to that basilica; others suggest it was a reference to Aula Majoris, a large hall of a nearby palace owned by St. Helena. The gate was also known as Porta di S. Croce because of its proximity to S. Croce in Gerusalemme. Vasi believed that its ancient name was Nevia, but he was wrong. 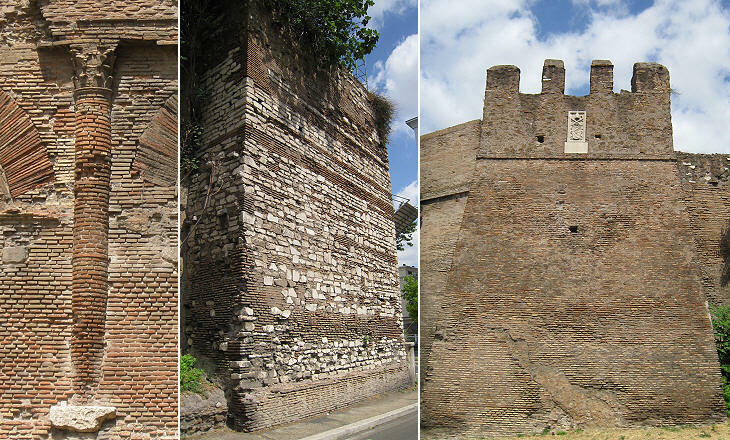 Porta Nevia was a (lost) gate of the Servian walls and it was situated near S. Balbina on the Aventine hill. The view is taken from the green dot in the small 1748 map here below. In the description below the plate Vasi made reference to: 1) Aqueducts of Claudius; 2) Via Labicana. The small map shows also: 3) Porta Maggiore; 4) Anfiteatro Castrense; 5) Republican tombs in Via Statilia. In 1838 Pope Gregory XVI decided to partially free the monumental arch by removing the gate built by Honorius; the remaining fortifications were pulled down after the unification of Italy in 1870. In 1956 the ground was brought back to its original lower level and cars were no longer allowed to go through the gate. Three lengthy inscriptions celebrate the completion of two aqueducts by Emperor Claudius and their restoration by Emperor Vespasian and his son Titus. An interesting aspect of the inscriptions is that they show the growing power of the emperors. TI. CLAUDIUS DRUSI F. CAESAR AUGUSTUS GERMANICUS PONTIF. MAXIM. TRIBUNICIA POTESTATE XII CO(n)S(ul) V IMPERATOR XXVII PATER PATRIAE ..
his name and the references to his family were followed by Germanicus, a title given to him for war victories, and by a series of "positions" he held in the frame of the republican institutions: pontifex maximus, tribune of the people, consul, imperator and father of the nation; the numbers say how many times a "position" was held. Imperator was just one of Claudius' titles and it was not given a particular evidence. IMP(erator) CAESAR VESPASIANUS AUGUST. followed by the reference to the positions he held. IMP(erator) T(itus). CAESAR DIVI F(ilius) VESPASIANUS. In these cases the title of imperator was emphasized by being placed at the beginning of the inscription. 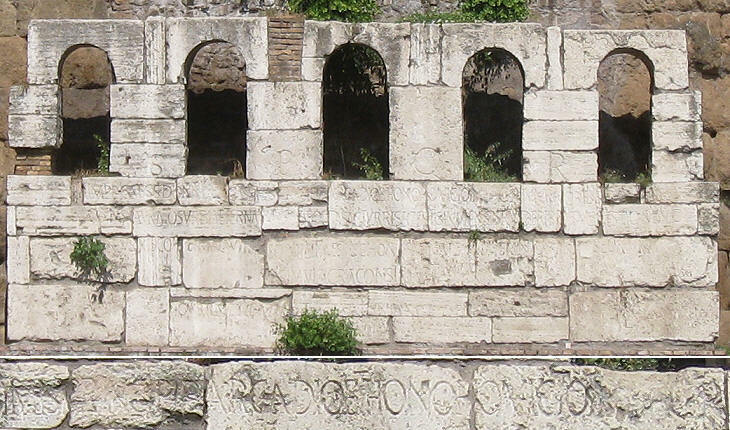 Similar (but shorter) inscriptions can be seen on the inner side of Porta Tiburtina. Anio Novus and Aqua Claudia were two aqueducts which carried water from springs near Subiaco in the Apennine Mountains. They joined together some seven miles east of Rome. You can see picturesque images of them in a page describing a walk to Porta Furba. 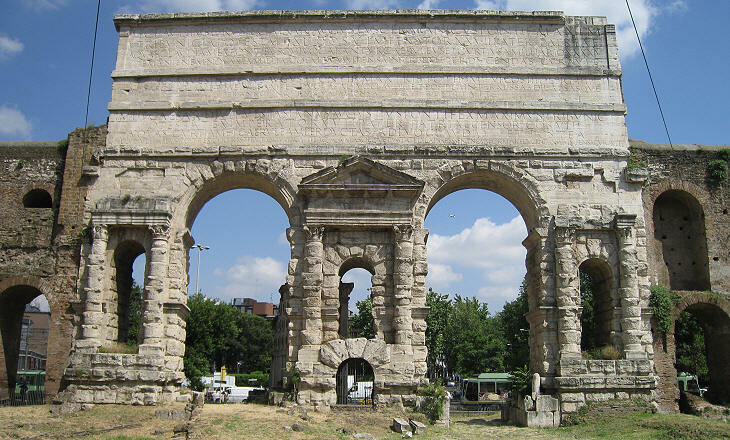 You may wish to walk along Via Prenestina and see some other Roman monuments or follow the steps of German historian Ferdinand Gregorovius who started from here his walks in the Roman countryside or learn more about Roman inscriptions. The upper part of the outer gate built by Emperor Honorius was relocated to the left side of Porta Maggiore. Historians set the split of the Roman Empire at the death of Emperor Theodosius in 395. His two sons (Arcadius and Honorius) ruled over two separate entities: the Eastern and the Western Roman Empires. The inscriptions on the gates built/restored by Honorius show that in Rome there was not awareness of this split because they make reference to both emperors. 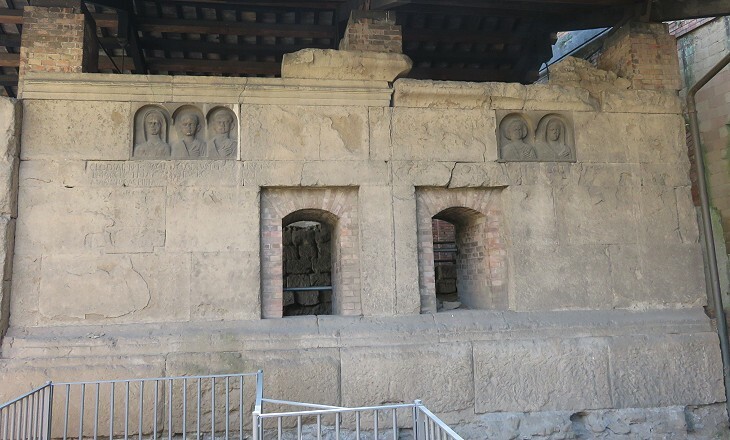 The restoration of Porta Maggiore has isolated an interesting tomb, that of Marcus Virgilius Eurysaces, a freedman, and of his wife Antistia. He was the owner of a bakery; it must have been a large one, because he described himself as a supplier of the state (in Britain he would have claimed to be a "purveyor to HM"). He celebrated his trade by decorating his tomb with reliefs depicting its phases "from manufacturer to consumer". The cylinders and the holes, one of which can be seen in the image used as background for this page, were most likely a reference to standard measures/containers for grain. You may wish to see a mill/bakery at Ancient Ostia. 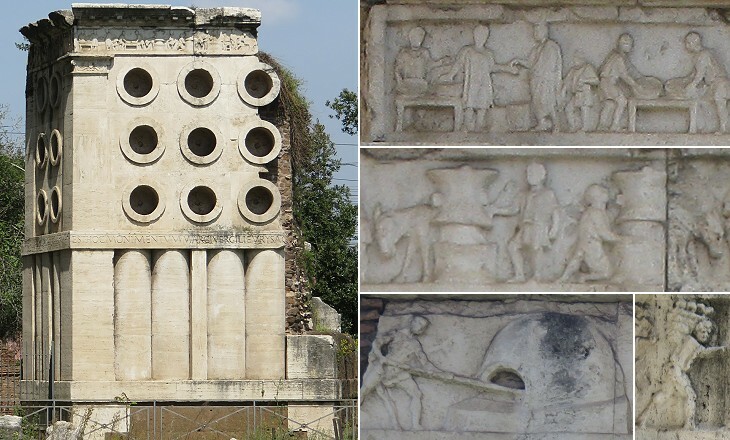 Maybe the area around Porta Maggiore was a sort of "industrial area" of ancient Rome because a sarcophagus found there was decorated with a grinding machine activated by a horse. The tombs in the proximity of Porta Maggiore were most likely all built before the construction of the aqueducts. In 1916 excavations made to enlarge a street found a series of funerary monuments of the late IInd/early Ist centuries BC. They were aligned along Via Caelimontana, a road which led from the Servian walls to Porta Maggiore across the Caelian Hill, so when these tombs were built they complied with the Roman law which prohibited burials inside the city. 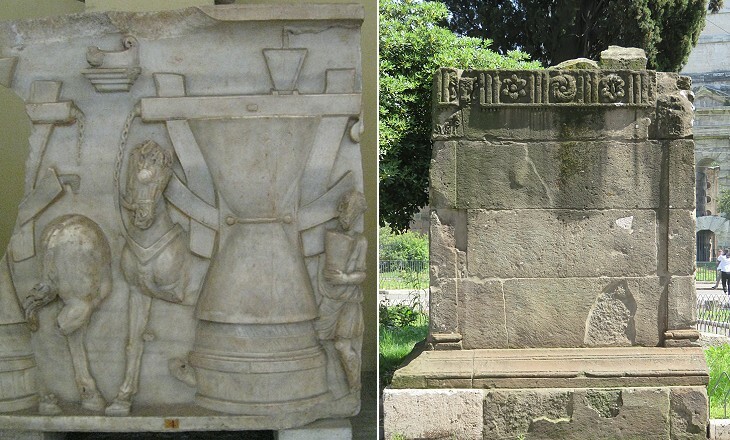 Sepolcro Gemino (Twin Mausoleum) is the most interesting of these tombs. It is made up of two identical funerary chambers. 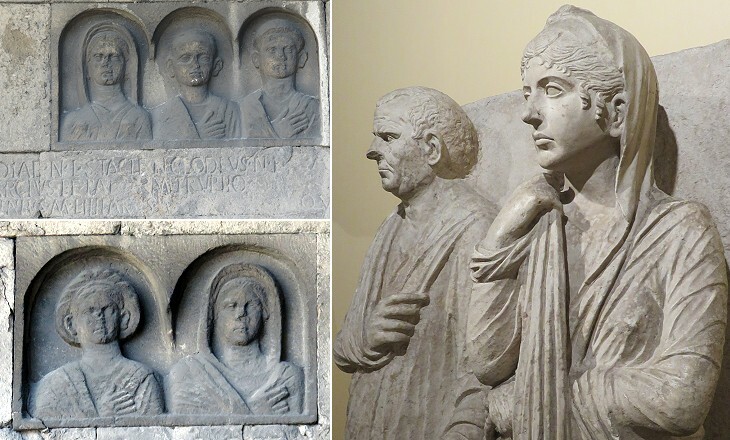 We know from the inscriptions that the dead were freedmen of important Roman families. Emperor Nero built an aqueduct which branched off Aqua Claudia at Porta Maggiore and carried water to his Domus Aurea. It was extended to the Palatine by Emperor Domitian. 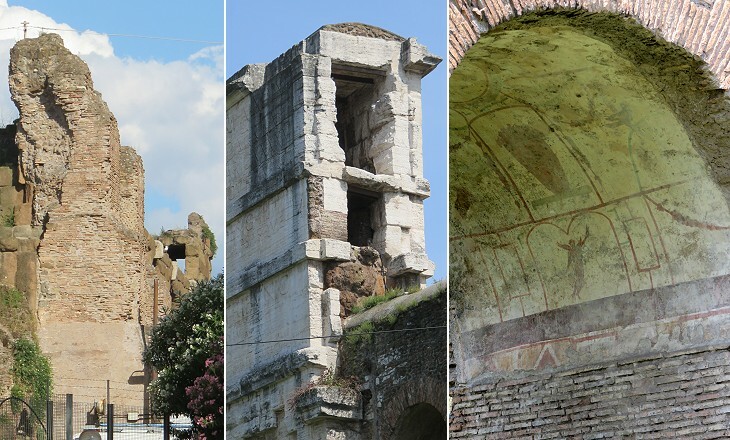 It can still be seen at many locations between Porta Maggiore and the Palatine, in particular a long section of the aqueduct can be seen near S. Maria in Domnica. Anfiteatro Castrense is the most interesting monument of this part of the walls; it is a IIIrd century oval stadium which was used for training purposes by the Roman army or more likely by the guards of the nearby residence of Emperor Heliogabalus. It was entirely made up of bricks; even the half-columns and their capitals were the result of elaborate masonry, similar to that of some tombs (e.g. that of Annia Regilla). It was incorporated into the walls by Emperor Aurelian and its entrances were closed. Its interior was eventually turned into a kitchen garden by the Cistercian monks of S. Croce in Gerusalemme. Next plate in Book 1: Porta S. Giovanni. Next step in Day 2 itinerary: Tempio di Minerva Medica. Next step in your tour of Rione Monti: Chiesa di S. Croce in Gerusalemme. Fu questa piuttosto castello dell'acqua Claudia, che porta della Città, mentre i condotti di quella si vedono ancor oggi passare sopra di essa. Fu chiamata maggiore forse dal magnifico arco formato di grossi travertini, sopra cui sono tre lunghe iscrizioni; una di Vespasiano, l'altra di Tito, e la terza di Onorio, dimostranti il risarcimento fatto all'acquedotto dell'acqua Claudia. Camminando poi appresso le mura, poco dopo la divisata porta di s. Giovanni, evvi una piccola cappelletta in cui si fa memoria di s. Margherita, e pochi passi dopo si vede dalla parte esterna delle medesime mura il teatro Castrense fatto di puri mattoni.